Between dozens of bones and joints, in addition to multiple connective tissues, a lot of issues can arise that can lead to chronic foot and heel pain. But the leading podiatrists at Great Lakes Foot and Ankle Institute PC offer modern treatment solutions for all causes of foot and heel pain, including plantar fasciitis and heel spurs. Book your exam at the Chesterfield, Clinton Township, Fort Gratiot, East China Township, Shelby Township, or Rochester, Michigan, clinic locations today. Schedule online or call your nearest clinic directly. While anyone of any age can develop plantar fasciitis, it most commonly affects adults between the ages of 40-60, especially if you work in a field that requires you to be on your feet all day. Plantar fasciitis leads to severe, stabbing foot and heel pain, although the discomfort you feel generally occurs after long periods of rest. For instance, plantar fasciitis sufferers usually explain that their condition flares up first thing in the morning, or after sitting for long periods. The more you start moving, the more pain starts to subside. Plantar fasciitis soreness and tenderness can also flare up after long periods of activity. You’re more likely to have plantar fasciitis pain after exercise, but not during exercise. 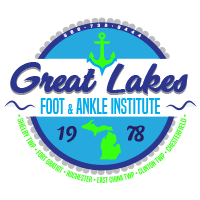 Whether plantar fasciitis seems to affect you regularly or just occasionally, you have plenty of treatment options available at Great Lakes Foot and Ankle Institute PC. If these conservative plantar fasciitis therapies aren’t effective for you, or if your plantar fasciitis and heel pain are worsening, it might be time to consider surgery. Your dedicated podiatrist at Great Lakes Foot and Ankle Institute PC can use minimally invasive arthroscopic techniques to remove heel spurs, release your plantar fascia, or repair damaged tissues, so you can experience lasting relief. Before your plantar fasciitis and heel pain get worse, start treatment at Great Lakes Foot and Ankle Institute PC. Book your evaluation online or over the phone with your closest clinic.